DmC will apparently be better than any game that Ninja Theory or Capcom could have made alone. 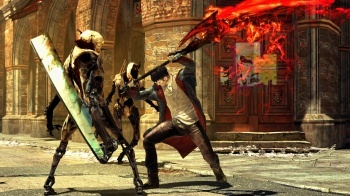 If you were worried about the combat in the upcoming fifth Devil May Cry game, called simply, "DmC," then don't worry, because Capcom - which knows a thing or two about the series - has been holding Ninja Theory's hand every step of the way. Capcom's Alex Jones, who is the co-producer on the game, said that DmC was a "fairly intensive" collaboration between Capcom and Ninja Theory, and that the amount of detail the two studios went into was almost like a "symposium on Street Fighter level combat." Translating for Capcom Japan's Motohide Eshiro, the other co-producer on the game, David Chrissop said that Capcom was imparting its combat wisdom to Ninja Theory, which - when combined with Ninja Theory's talent for character and story - would result in a game better than either company could have made alone. Assuming that this isn't just marketing spin, it sounds like DmC stands every chance of being one of the best Devil May Cry games around. A game with the amazing combat the series is known for, and characters who have personalities beyond "smug," "angry," or "angsty?" That sounds like a very interesting Devil May Cry game indeed. DmC comes out for Xbox 360 and PS3 in 2012.